Disclaimer: This post was sponsored by Egg Farmers of Ontario. Spring is definitely in the air and Easter is right around the corner so it was great to receive an eggs-citing (see what I did there?!) lacto-ovo vegetarian friendly dessert recipe from Egg Farmers of Ontario. 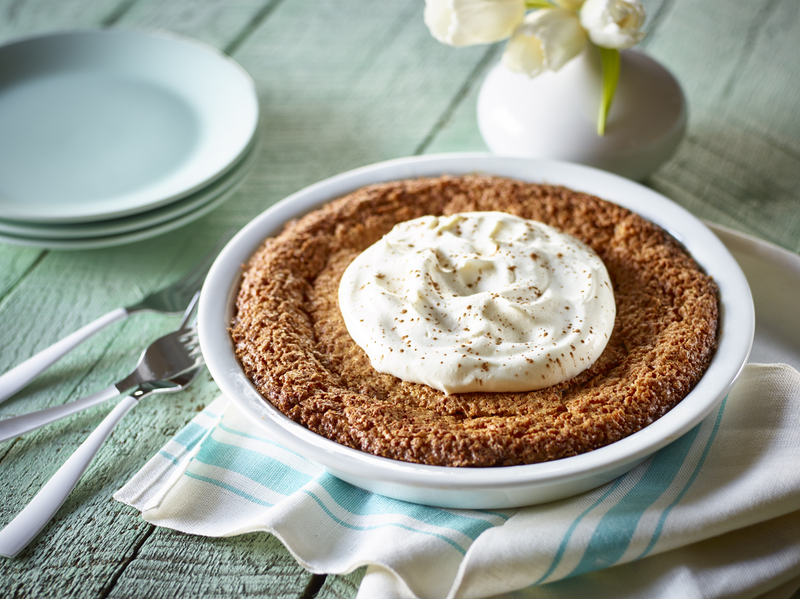 Their Crustless Chai-Coconut Pie is fairly easy to make and the unique flavour combination is sure to be a hit with the foodies at your Easter table. What I loved about the Crustless Chai-Coconut Pie is that it is an easy dessert that’s suitable for a special event such as Easter, but it’s also simple enough for less formal occasions. If you would like to learn more about Egg Farmers of Ontario, please visit getcracking.ca for a copy of this recipe and tons of other egg recipes that are sure to please you and your family. An easy and aromatic dessert that’s suitable for any occasion. Dress it up topped with rum spiked whipped cream! Pre-heat oven to 350°F (180°C). Grease a 9-inch (23 cm) glass pie plate. In small bowl, combine flour, spices and baking powder. Set aside. In a medium bowl, using an electric mixer on medium speed, beat together butter and sugar until combined. Add eggs and vanilla and beat until creamy and well blended. Stir in cream and flour mixture; mix well. Stir in coconut. Pour into prepared pie plate. Bake for 35 to 40 minutes or until set and golden brown. Place on rack to cool. Serve at room temperature with whipped cream, if desired. Tip: Use shredded or flaked coconut for this recipe. Tip: Cover and refrigerate leftovers for up to 3 days or freeze for up to 2 months. Nutrients per serving (1/6 recipe): 360 calories, 17 g total fat, 181 mg sodium, 49 g carbohydrates, 2 g fibre, 6 g protein. Excellent source of vitamin B12. Good source of folate and iron.